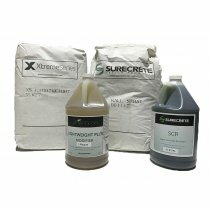 SureCrete’s XS lightweight Plus 3SureCrete’s XS lightweight concrete casting mix is a dual component.. THIN CONCRETE OVERLAY MICRO TOPPING TIGHT TROWELED SureCrete’s Micro Top..
WallSpray from SureCrete is a sprayable, vertical surface coating that allows you to ..
VERTICAL STAMPING CONCRETE Lightweight Carvable OverlaySureCrete’s Wall Stamp is a concre..
SureBroom Broom Finish Concrete Overlay (50lb) from SureCreteBroom Overlay Resurface Old Concrete M..
SureTex- Concrete Knockdown Overlay Resurface(50lb) from SureCreteSureCrete's SureTex is a single c..
SureSpray - Concrete Overlay Mix Floor Thin Texture (50lb) from SureCrete WhiteSureCrete’s Sur.. STAMP CONCRETE OVERLAY 3D FLOOR BAG MIX – SURESTAMP FROM SURECRETE	SureCrete’s SureStamp is a stamp..